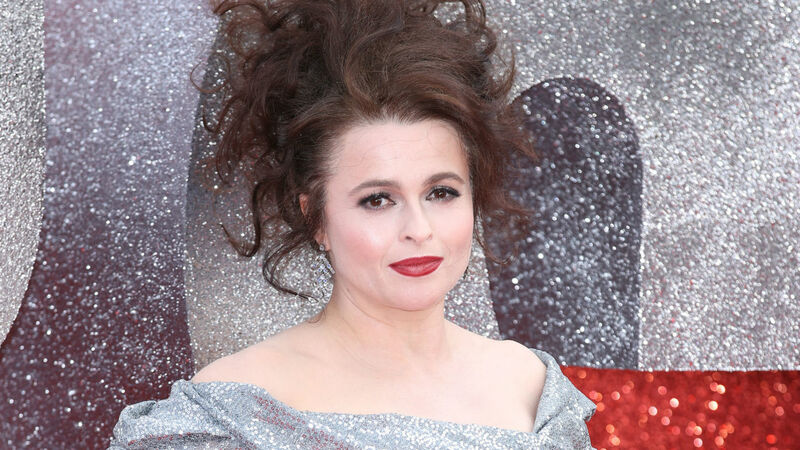 Prepare yourselves — the first photo of Helena Bonham Carter as Princess Margaret in The Crown is finally here, and it is so good, you might not be able to contain yourself. On Monday, Netflix released an image of Olivia Colman as Queen Elizabeth II, and now fans are finally seeing the talented Carter as the woman brought to life by Vanessa Kirby in the first two seasons. The picture is also captioned, "Hope." How fantastic is that? In May, Carter was officially cast as Margaret for seasons three and four after rumors began to swirl she would take on the part. When the news became final, the Ocean's 8 actor commented (via Variety), "I’m not sure which I’m more terrified about — doing justice to the real Princess Margaret or following in the shoes of Vanessa Kirby’s Princess Margaret. The only thing I can guarantee is that I’ll be shorter [than Vanessa]." As with Colman taking over for Claire Foy, it will certainly be an adjustment to watch Carter portray the character Kirby portrayed so well (she even scored a 2018 Emmy nomination in the best supporting female actor in a drama). But there's no denying Carter is a phenomenal actor herself. It's such a tease, especially with The Crown season three slated for a 2019 premiere. Is it going too far to say this is already an iconic moment? Helena Bonham Carter as Princess Margaret, looking as cool as hell in the third series of The Crown. Where were you when the first image of Carter as Margaret was shared? https://twitter.com/Meer_Aria/status/1019523410857250817She deserves all the praise. 8. Who else can't breathe? Also, on Wednesday, the first photo of Ben Daniels (The Exorcist, House of Cards) as Antony Armstrong-Jones, aka Lord Snowdon, Margaret's husband, was posted on Twitter. According to Variety, at the time of his casting, Daniels said about taking on the role played by Matthew Goode, "Snowdon was such a dynamic and complex man. I’m really looking forward to playing him." Maybe the first photo of Tobias Menzies (Outlander) as Prince Philip will drop sometime this week too. Season three can't get here soon enough.